Ever since that recipe for my Zucchini Lasagna, I’ve wanted to do a series on “Italian casseroles.” I mean, can you go wrong with a skinny-fied version of “baked ziti”? So, instead of subjecting you all to a week of casseroles to please myself, I’m just bringing you a casserole with an Italian name: tetrazzini. It’s actually not Italian. It’s American. Woot-woot, America! I did a little research and apparently, this casserole is named after an Italian opera singer and is rumored to have originated in San Francisco. Some also say it started in New York City. I vote New York City, ‘cuz I’m an east coast gal. Whenever I say I’m “Italian,” I usually say “Italian American.” That doesn’t make me any less in love with all things Italian. Us “Italians” tend to be proud of our roots. Actually, my grandfather can’t complete a sentence without giving an anectdote about Italy. Typical. I love him with all of my heart, because he taught me to love food and to “live to eat,” not “eat to live.” Him and my grandma, of course. 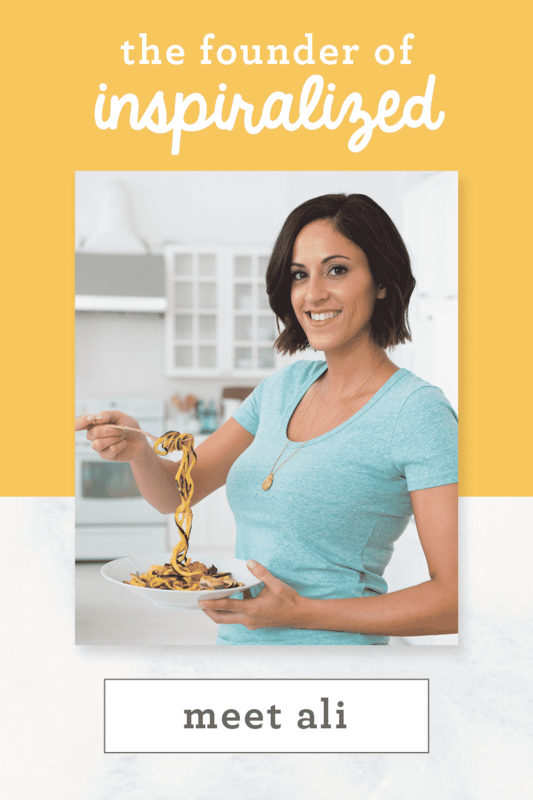 Sidebar – one of my recipes in my cookbook is going to be my grandfather’s meat sauce with my grandmother’s meatballs. You’re going to love it, as I have for 27 years. Back to this recipe. 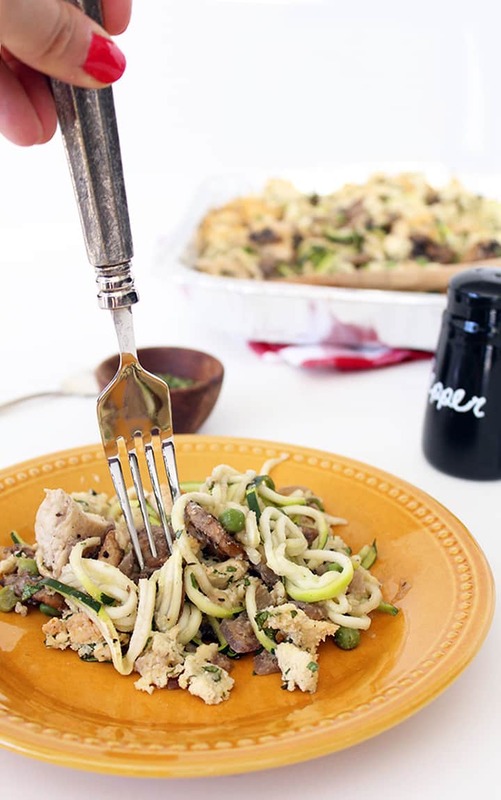 A tetrazzini is basically a spaghetti casserole cooked with mushrooms, peas and typically turkey. It’s cooked in a gravy with a splash of white wine. Well, we’re family-friendly here, so no wine. And of course, no butter or cream here. We’ve used coconut flour to create the gravy with a light chicken broth. Works like magic! 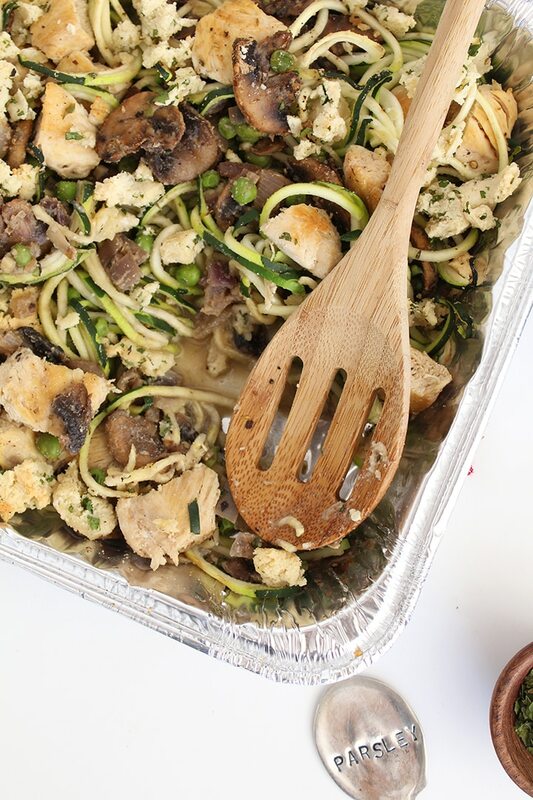 You’d think that this casserole would get runny and mushy, on account of the zucchini noodles. Au contraire! The proportions here are set so that you avoid any excess moisture: just creamy, deliciousness. 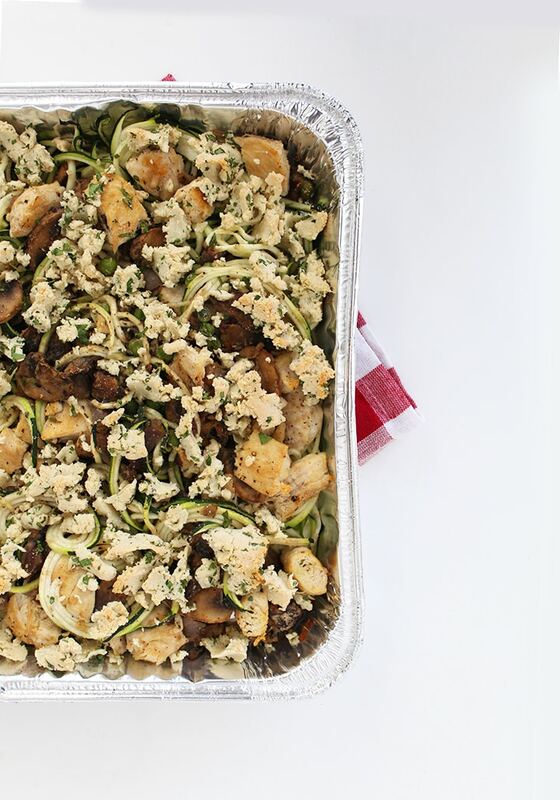 Don’t worry if your casserole appears dry when you put it into the oven – remember, the zucchini releases moisture. The “breadcrumbs” on top are actually made of seasoned almond meal with chicken broth… which I learned how to do after reading this – gosh, you Paleo peeps are geniuses! It’s important that you season beforehand – it adds much-needed flavor to the almond meal. 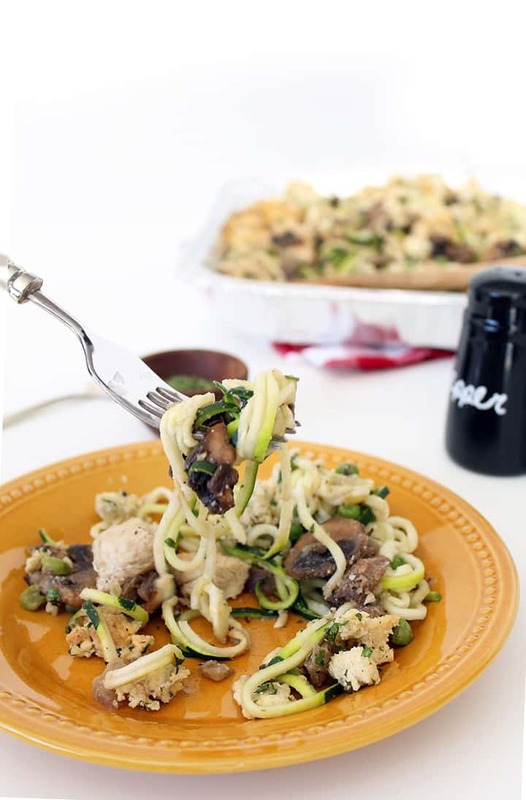 Altogether, this chicken tetrazzini with zucchini noodles is going to be your new favorite weeknight casserole meal. Minus the love handles! Do you like casserole recipes? Would you like to see more? Place a large skillet over medium heat and add in 1 tbsp of the olive oil. Add in your chicken and season with salt and pepper. Cook for 3-5 minutes on each side or until the chicken is no longer pink on the inside. Remove skillet from heat and remove chicken with tongs or a slotted spoon and cut into cubes, and set aside. 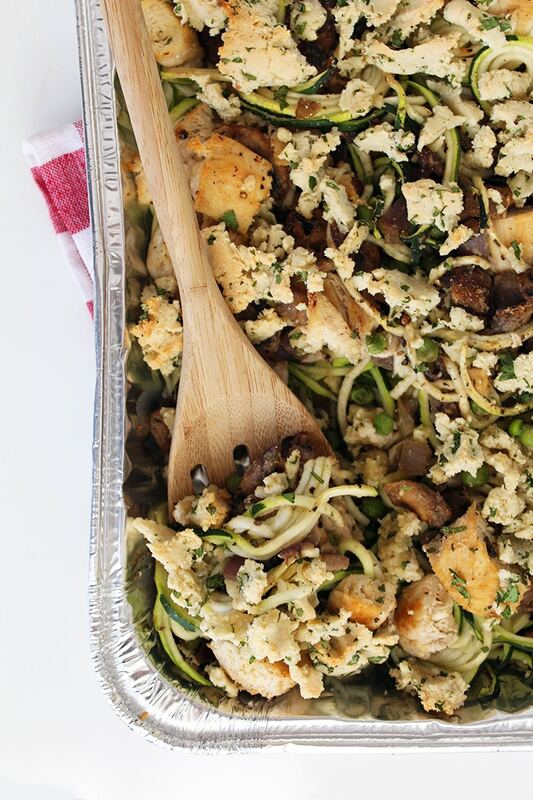 While the chicken is cooking, place your zucchini noodles into a roughly 10 x 10 casserole or baking dish. Set aside. Also while the chicken is cooking, place your almond meal and basil, oregano, parsley, and garlic powder in a bowl. Season with salt and pepper generously and then toss to combine and then add in the chicken broth. Using your fingers, roll like a dough until all of the meal is formed into dough. Set aside. Place the skillet back over medium heat and add in the rest of the olive oil. Let heat and add in the garlic and red pepper flakes. Cook for 30 seconds and then add in the onions, thyme, mushrooms and peas. Season with salt and pepper and cook for 3-5 minutes or until mushrooms wilt. Add in the chicken broth and let reduce for about 1 minute. Then, push vegetables to the side and add in the flour. Whisk immediately until creamy and then push the vegetables back in and stir to combine. Cook until the chicken broth is reduced. Pour the mixture evenly over the noodles, add in the cooked chicken and toss in the baking tray to combine. Once combined, evenly spread the mixture in the baking tray. If the mixture seems to try, evenly pour over 1/2 cup of chicken broth. Take the almond meal "dough" and crumble into breadcrumbs over the casserole, evenly until all of the "dough" is used. Sprinkle over the casserole with the fresh parsley and bake 20-25 minutes. We aren't mushroom fans - Can this be made as written and just omit the mushrooms? Any other add-ons that would be great to replace the mushrooms? 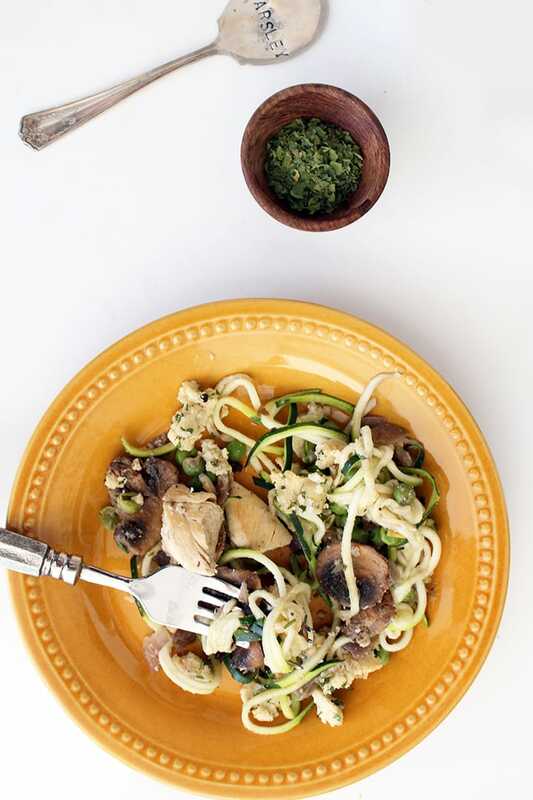 Tetrazzini is classically made with mushrooms and there's where a lot of the warm flavors come from, but if you want something for texture, try subbing in roasted peppers, string beans, thickly sliced onions or even broccoli! WOW!!!! Can't wait to make this! Yum!! So excited for this recipe! Do you think it would hold up being stored in the fridge, if I made it for lunches throughout the week? What a lovely "transposition"? of the original recipe for those of us who eschew gluten...you've captured the essence of the dish and made it, dare I say(? ), gut-friendly. 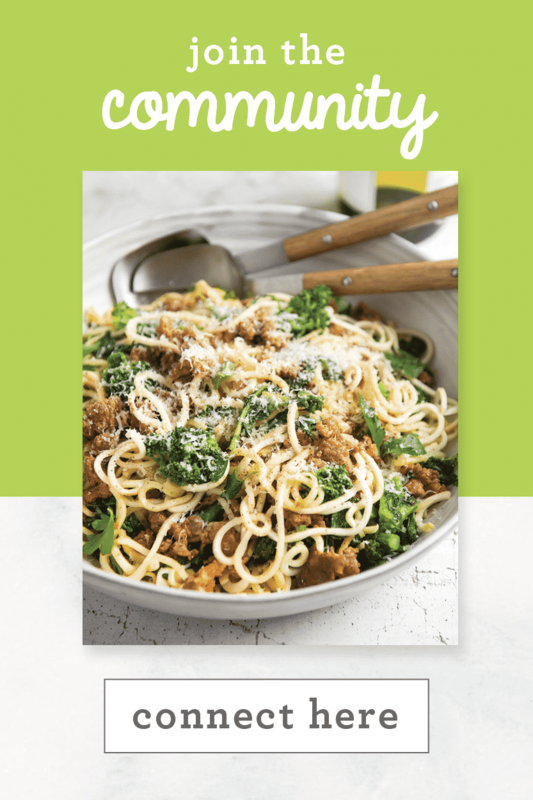 First on my list to make, once my Paderno spiralizer arrives. Looks AMAZING! In step 6, are you adding in the coconut flour? Just want to make sure. 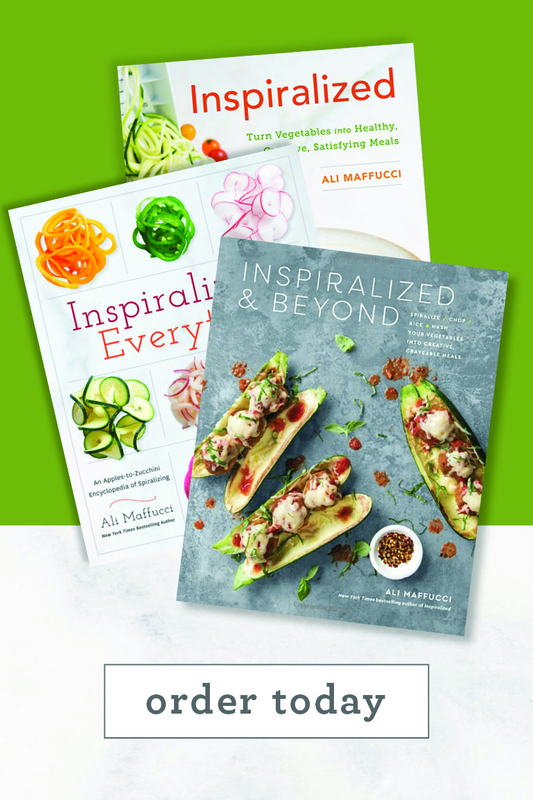 :) Can't wait for your next cookbook! Looks delicious, Ali! I am making this tomorrow. I am always curious what a 'medium zucchini' is, size-wise? 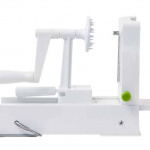 Would you consider including oz estimates for the spiralizer vegetables? Here in the midwest, in winter and spring, our zucchinis are tiny. Thanks for the great recipes! Hello-- if using all-purpose flour, does measurement stay the same? This looks delicious! 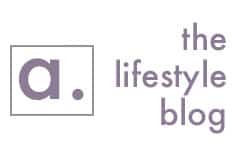 Do you post nutritional information with your recipes? Thanks. 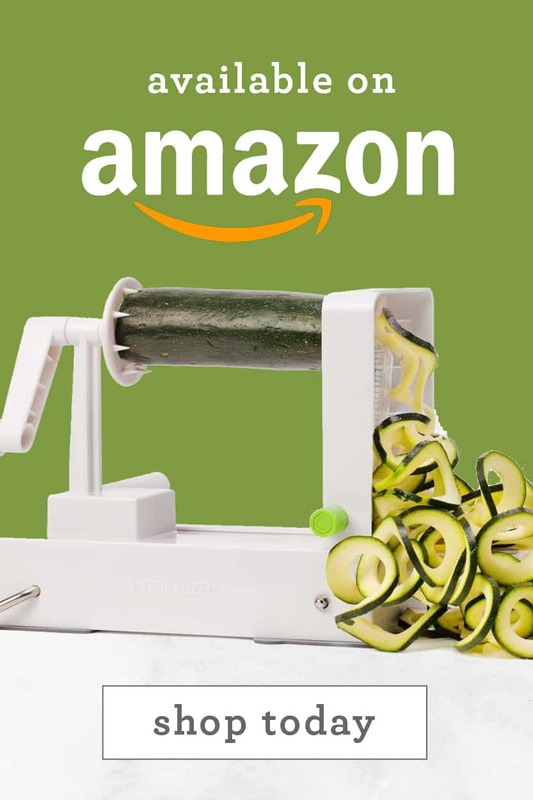 I just received my spiralizer a couple of days ago. I can't wait to try this! I can't believe that the coconut flour and chicken broth make a gravy! Genesis!! This is definitely on my recipe menu for next week! Just made this - it is so good!! I added a carrot cuz i had one to use (not traditional!) but good. I accidentally over salted my "bread crumbs" - oops :( But they are a delicious addition otherwise. This dish is worth the effort. Thanks for creating the recipe! Sue - I've JUST started doing that, so I won't be updated the old recipes for a while. That will be an ongoing project. Can you make this ahead of time and leave it in the fridge? Please proof read your recipes. 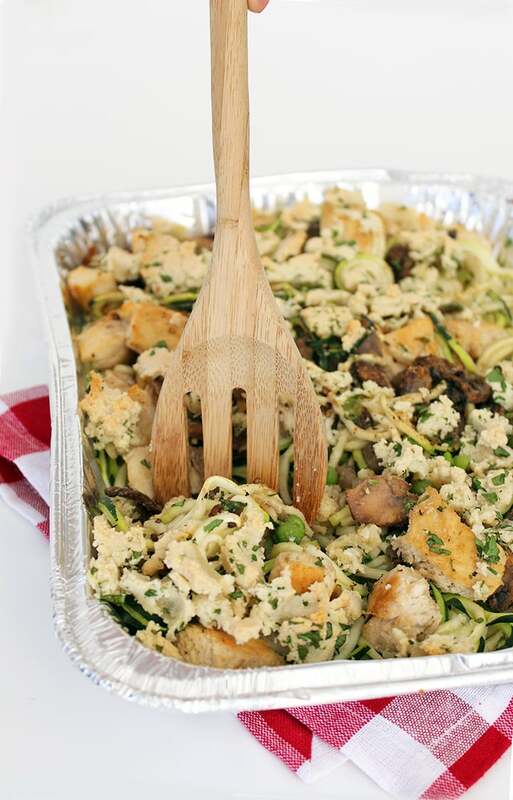 ( Chicken tetrazzini). When you mention adding red pepper flakes, what red pepper flakes? I made this today and it took much longer to prepare than stated. I love many of your recipes; however, this was not a favorite. Oh no, I'm so sorry to hear you didn't like this one! It's just a pinch of red pepper flakes, I've amended the recipe, thanks for catching that. I do proof all my recipes, but I'm a one man show and a human, so errors are bound to happen - I'm grateful for my readers who catch these slipups!! What didn't you like about the recipe? I did not care for the bread crumb mixture, thinking the oregano was too overpowering. I think I might leave that out next time. On a positive note we love your Deconstructed Manicotti with Zucchini Noodles and Spicy Moroccan Chickpeas with Beet Noodles. 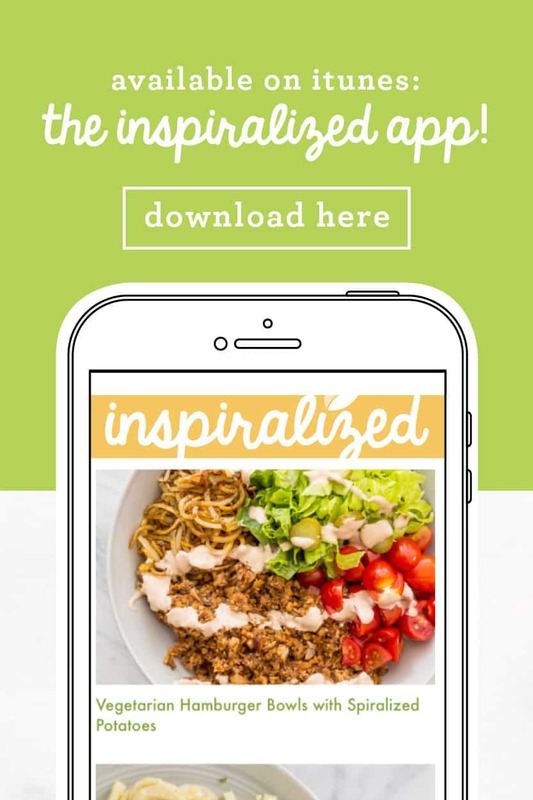 I love my spiralizer and so glad you have so many recipes to try! This looks awesome. I have a question, what is almond meal? My daughter has a tree nut allergy so I'm wondering what I could substitute it with? Also I would want to use wheat flour in place of coconut flour if that's OK? Yes, you can use wheat or coconut flour, of course! What is almond meal? Just trying to figure out what I can substitute it for. Thx!! This recipe looks amazing! Unfortunately, it is really hard to follow. With multiple ingredients listed multiple times and added in multiple steps, its hard to not mess up. For instance, I added the larger amount of chicken broth to my topping instead of the lesser amount, which obviously messed up the topping. It would be very helpful if the topping ingredients were categorized and so on. I just pulled it out of the oven and am hoping my soupy topping didnt mess it up too much! so it wont stay in the fridge for long?? im a single lady and cant eat it probably in 2 days....so can i freeze some of it?? would it freeze ok??? 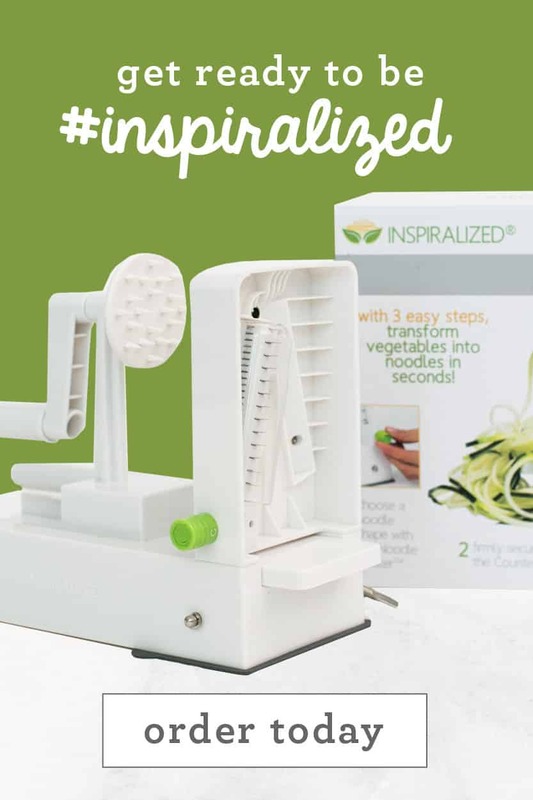 Hi Alissa- I just bought "the" spiralizer (my old one broke and i didn't realize that yours was different when i bought the 1st one. It.Is.So.Much.Better. And smaller. Thank you!